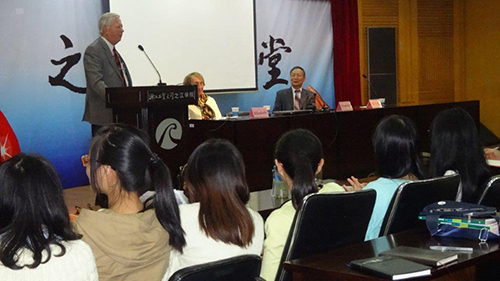 Kury speaking on Pennsylvania's environmental revolution to students at the Zechiang University of Technology in Hangchow, China in October 2013. 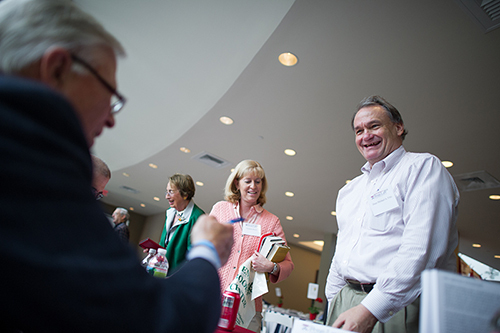 The author inscribes his book for Michael Fitts, Dean of Penn Law School, (on right) at the Law School’s Alumni Author Book Signing Event during the 2013 Reunion Weekend at the Law School. Beth Kury, the author’s wife, is third from the right in the green jacket. Photo courtesy of the Penn Law School Alumni Office. Franklin Kury speaks on government reform and environmental subjects at conferences, workshops, retreats and book signings. He has spoken to the Pennsylvania Political Science Association, the storm water management workshop of the Pennsylvania Environmental Council, the Susquehanna River Heartland Coalition, the legislative conference of the Pennsylvania legislature, the Chesapeake Bay Foundation staff, the Pennsylvania Fish Commission and the Pennsylvania Parks and Forest Foundation, as well as book signings at Susquehanna University, Bucknell University, the State Museum of Pennsylvania, the University of Pennsylvania Law School, and various libraries in Pennsylvania. He has also appeared on the Pa. Cable Network’s "Pa. Books" program, WITF’s radio “Smart Talk” and Radio Station WKOK's "On the Mark" program. - Gerrymandering in America, Its Past and Its Future.